The ASCO Guidelines app, from the American Society of Clinical Oncology, provides healthcare professionals with recommendations for cancer treatments and prevention. 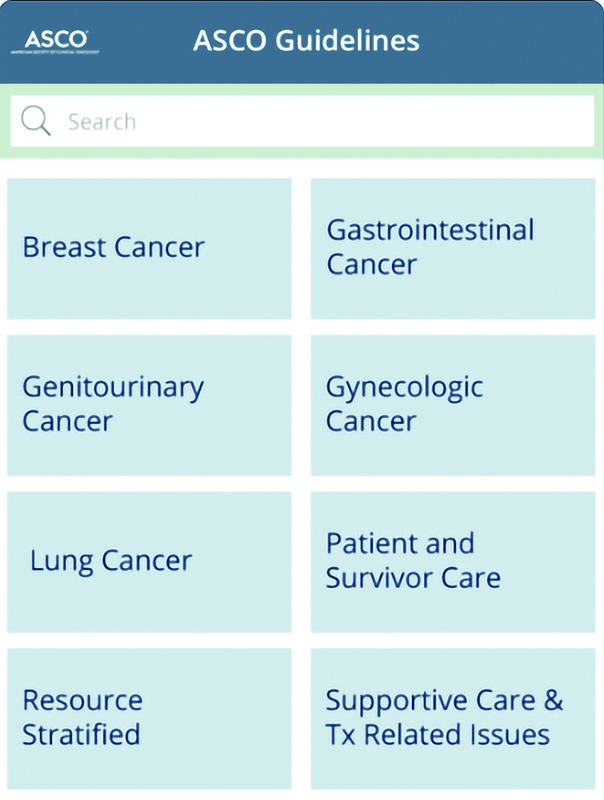 The app covers several different types of cancer, ranging from breast cancer to thoracic cancer, and also provides information about available assays, predictive markers, and patient and survivor care. Each guideline comes with recommendations for treatment or prevention, ranked based on the amount and strength of evidence supporting the treatment type. Some guidelines are not yet included in the app itself, but the app does provide external links to the ASCO website for further reading. Users can also take notes directly in the app and search for relevant keywords. The ASCO Guidelines app is a useful tool for healthcare professionals in the oncology field who are looking for evidence-based recommendations for treatment.